Hair is one of the most important parts of women’s style. It shapes your face and almost always is the first thing people see, when they look at you. Ghana braids is a popular hairstyle, originating from Ghana nation. There are a lot of Ghana weaving styles, that a completely different in thickness of the braids and their stowage. Although they are quite difficult to do and often require hair gel and other additional instruments, the result is really rewarding. These styles look especially good on ladies with a round face. This Nigerian hair style comes from the Hausa tribe. It also has its substyles, like Wodaabe, Suku and Patewo, each of them looks really different and unique. Patewo is a hairstyle, that resemblances two hands, hold together, that’s why its name means “clap your hands”. It is fairly popular among youth, who still want to include traditional elements into their style. Suku is a popular style too, it is formed by the thick braid, gathered on the back. Another representative of the traditional Nigerian braiding hairstyles, these styles look like reversed braids. It looks really original, and it can be made either as a Nigerian natural hair style or with the use of extensions. Didi requires a constant care, with regular moisturizing and conditioning. 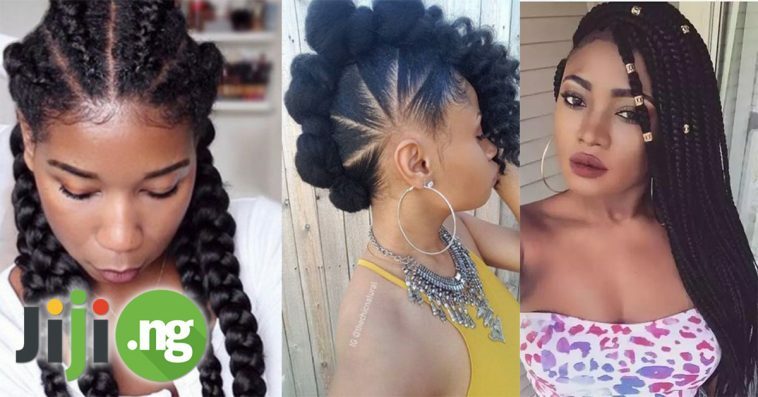 Popular Nigerian hairstyles 2017 include this style, because it is easy to make and maintain for curly hair. It doesn’t strain your hair, furthermore, it allows it to be free and to recover from all the fancy and stylish hairstyles, and healthy hair will always look beautiful. Contrary to anything you might’ve heard, shortly cut hair is not only healthy, but also really feminine and stylish. Furthermore, you will feel really comfortable, you won’t need to strain your hair combing it, your overall care for your hair will be minimized. Short styles in Nigeria are becoming more and more popular thanks to the celebrities who have chosen it. One of the most popular hairstyles in Nigeria include using Brazilian curly hair extensions. Brazilian hair is one of the best on the market, and it will add a lot of volume, shine and shape to your natural hair. Curly hair is most commonly used and there is a pretty big variety of their sizes, but you can even find straight Brazilian extensions to diversify your style. This simple and yet classical style is the easiest to make and easy to maintain. It is definitely more casual, than all the others, but you can add some depth into it by leaving some strands on the sides to underline the contour of your face.